Adele! Gareth! I missed you guys! After finishing the first set of books I thought we were at the end of adventures for Gareth and Adele. While I understand when authors want to move on I thought there was more that could be explored in this world. 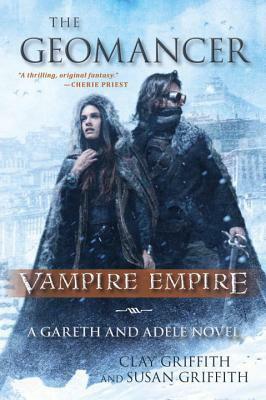 So you can imagine how excited I was to learn that The Griffiths would be returning to the Vampire Empire world. When I started reading it I did forget a few things that happened in prior books since it’s been a few years, but I wasn’t completely lost in what was happening. I do think if you’re new to this series that it would be to your benefit to start from the top. One book builds on the other. One improvement I noticed is that I was engaged from beginning to end. In the prior books they got off to a slower start for me and I didn’t really feel pulled in until later. One great thing about this series is that it’s so imaginative and the world building remains excellent. You really feel like you’re escaping into their world of airships and flying vampires, etc. The action and adventure remains top notch. Adele and Gareth continue to make a great team with even better chemistry. They really are one of my favorite couples in the urban fantasy world. What’s even better is that even while they’re together they remain strong and interesting characters individually too. I liked that we were introduced to new characters but we saw familiar faces as well. I do wonder what is up with this new trend in books that I’ve been reading where the protagonists age prematurely. In the past it’s usually the reverse issue when dealing with supernatural characters. I’m not totally sure what that accomplishes. For the most part the plot was entertaining and moved along well. It accomplished what few books are able to do; it gave me book drop! I gave this a full 5 stars and though I haven’t read as many books this year, it is one of my favorites by a large margin. I’d love to re-read it at some point. As it stands now, my thirst for Gareth and Adele shall remain insatiable! I already can’t wait for the next book! *ARC received by publisher in exchange for an honest review. Pyr, the publisher for this wonderful series, has been so kind to team up with me to offer a giveaway!! The more entries the better your chance to win! Good luck! And don’t forget to comment! Thanks for the giveaway! I am super looking forward to reading this book. Entered. Haven’t read any of them yet but will do so hopefully soon! Entered. Love these in audio! I want to read these books.